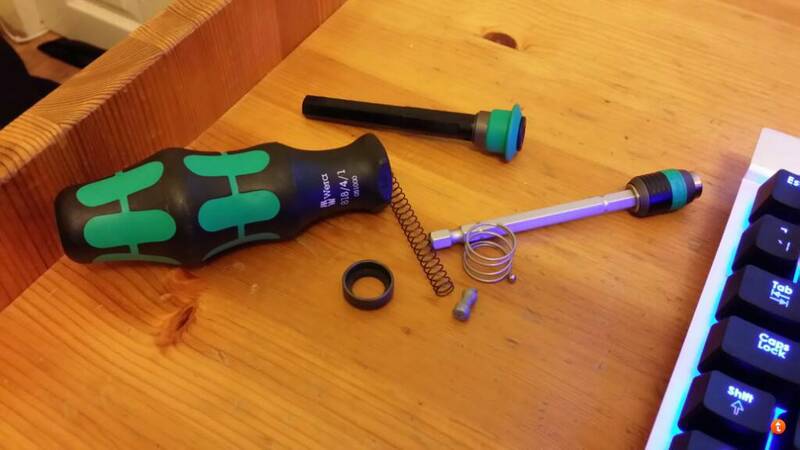 This is my review of the Wera Kraftform Kompakt 20 Screwdriver. It is a nice looking screwdriver with the nice Wera Kraftform handle, and works as a short and full size screwdriver. It also comes with a nice pouch, with belt loop, for safe keeping. Another feature worthy of noting is the rapidaptor on the shaft, a very nice bit holder - rapidaptors stop the bit from falling out of the bit holder, or getting stuck in screws, and they do an amazing job of it. The shaft of the screwdriver extends and can also be removed, to use as a bit holder for a drill. It can be extended by pushing down once on the green collar at the base of the shaft. It is spring loaded, so it pops right out. You can then hold the collar down, and pull it out the rest of the way to use with a drill. To put it back in, hold down the collar, and push it in. Simple. The adjustable length (to 2 positions) is a great feature for a screwdriver, and it's been very handy. It comes with 6 bits stored inside the handle, which is also spring loaded and pops open when you push a green button on the base of the screwdriver. Inside, you should find PH1, PH2, PZ1, PZ2, SL1.0x5.5 and SL1.2x6.5. So it's all good, or it was for about 6, 7 months, or around that. Remember what I said about the shaft? It's spring loaded... Well, one day, I was just minding my business with my screwdriver, when I pushed down on the collar and the entire insides - ball bearing, springs and the lot - flew across the room. It wasn't fixable. As it was a Wera product, I was sure it was just a one-off. I took it back to Screwfix, where I had paid £32 for it, and asked for a replacement. After about 10 minutes I got one, and was happy to have my favorite screwdriver back. A month or two on, or perhaps a bit less - guess what? Yeah, the insides shot out again. I've decided that Wera have made a terrible screwdriver here - It's not the usual Wera quality, and certainly not worth £32, or the £30 it now costs on Amazon. Two of them have broken inside a year, due to the same manufacturing fault. It's going to be tough to find a replacement that performs, or at least claims to perform, this number of functions in such a compact piece of kit. I do not recommend purchasing this! Thankyou for that comprehensive review. It is spring loaded, so it pops right out. Well, one day, I was just minding my business with my screwdriver, when I pushed down on the collar and the entire insides - ball bearing, springs and the lot - flew across the room. It wasn't fixable. ...............and so I wasn't surprised to read that. It's probably OK as an occasional DIY tool, but anything like that is unlikely to stand up to daily use. .......and it should be condemned just for having a stupidly spelt name! Big difference with mine is that it didn't come from poofix!! Don't trust them ckufers, one bit. And royaloak, I have plenty of Wera stuff that I do like - aside from the impaktor holder. I really wish it was a rapidaptor... I'll write reviews on some of my other Wera kit soon, and some other tools I am particularly fond of. I've actually settled on the Bahco ratcheting screwdriver as my replacement, the one Chez reviewed. It looks like a quality screwdriver, I just wish there was an alternative that was more compact - perhaps one day. Wera also do a ratcheting screwdriver, similar in design to the Kraftform Kompakt 20, only the shaft is fixed to full length, non-removable, and for some reason has a standard magnetic bit holder instead of a rapidaptor - what? There was no light either, and the light on the Bahco is bound to come in handy. Can't seem to spot an edit button for my last post, which is weird because I'm sure I've seen one before! Anyway, I just wanted to add to my review. If you go on Amazon, you will see that this product has only positive reviews. It's possible that Screwfix got a bad batch of this product, and gave me two screwdrivers from this bad batch - reasonable guess as I don't think they sell loads of £30 screwdrivers. However, I did use this all the time. It was my go-to manual screwdriver, so it's possible that all the springs just aren't up to long-term use. So either Amazon didn't get any bad batches of these screwdrivers, or the people reviewing them don't use the screwdriver often enough for this to happen. probably Screwfix bang them right down on price and so they do production runs of slightly inferior quality product especially to meet the low costs screwfix want it at. Even the little biros in screwfix don't work properly! Since I used it so often, I couldn't resist ordering another from Amazon. I'll see what happens with this third one. I can attest to that having several times bought tools (Bosch) which have been missing one or two features which would otherwise be fitted had I bought elsewhere (e.g. the GSB21-2RE which didn't have a "dial-in" speed selector trigger button - a mionor annoyance for many but rather important to me). Deffo a firm where caveat emptor applies! I really just wish there was an alternative that was more compact - perhaps one day. 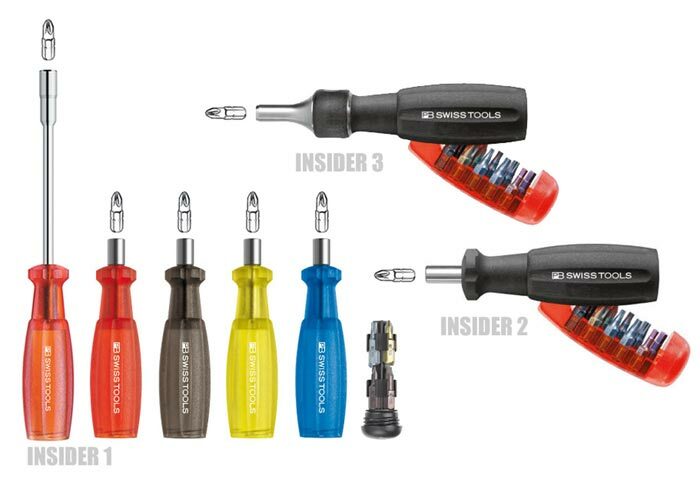 Resurrected to recommend PB Swiss PB Swiss' Insider range includes a ratcheting screwdriver. Although I couldn't afford this particular ratcheting screwdriver, all my PB Swiss stuff has been better than Wera/Bahco. Made-in-Switzerland isn't cheap, but there's no doubting the quality's exceptional.